The Quilting Edge: Improv Through the Eyes of a Five Year Old/I'm Not Copying Anything. Improv Through the Eyes of a Five Year Old/I'm Not Copying Anything. Since I was babysitting two of my granddaughters today, I thought I would let them each make a little quilt (16" square). Most of my craft things and toys are back at the house being renovated so I thought a little fabric play might be in order. 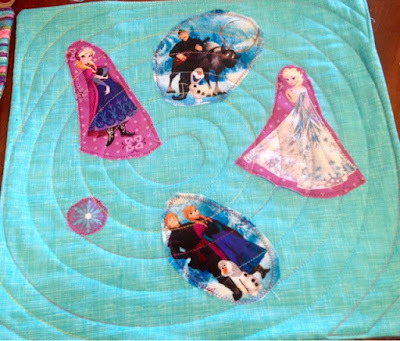 Recently at the EMQG retreat, we were chatting around the lunch table about how each of us actually started quilting. The majority of us started by playing in the scrap bin of either our mother's or grandmother's. I like having my little ones play in my scrap bins. 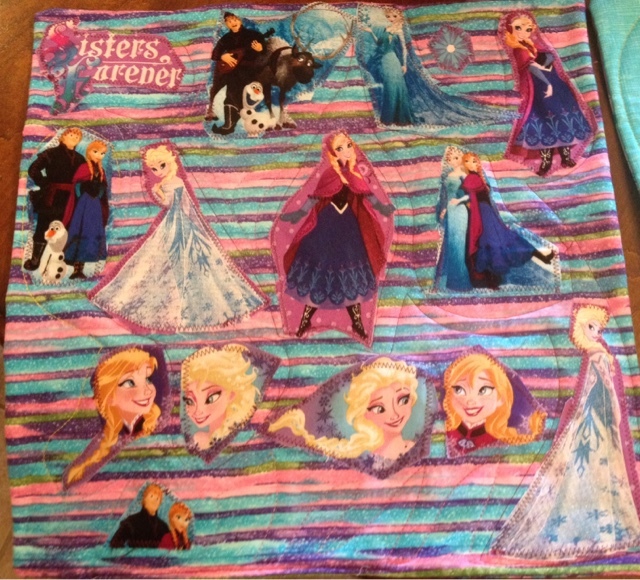 My thought was to have them pick out a few strips and I would sew them down QAYG (quilt-as-you-go) style. I should have known the five year old would have ideas all of her own. She lit up like a Christmas tree at the thought of making her own quilt. Armed with several fabrics....and not from the scrap bin I might add she said, " I need to pick out the background fabric." So we scrapped my idea and we ran with her's. "I'm not copying anything,that's what makes it so special!!" "It's all my own idea." 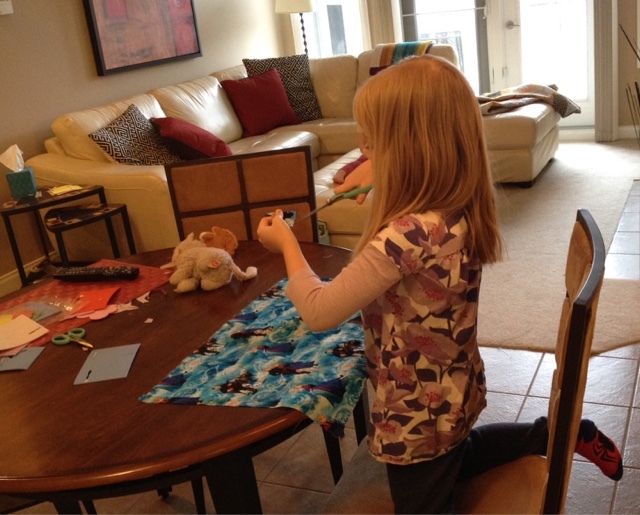 "I am so amazed that I am making a quilt!!" Her fearlessness and delight warmed my heart. 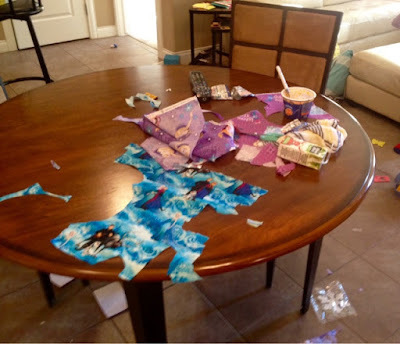 The house was covered with mess....because there was a three year old involved as well. And of course a little snacking along the way. Oh well, the mess was worth the result. Paige cut out all the shapes and pinned them in place. She picked out the thread colour and pointed out where to quilt. I'm not quite ready to let her use the machine but the girls love pushing the thread cutter button. Little Autumn (three) picked out the background fabric for her quilt and told me which shapes to cut and where to put them. She lost interest after that and got busy dumping the pins and picking them up with a magnet. Making memories that will last all of your life times! Precious! That looks like fun. Maybe soon you will have them make several of those panels and they you can join them together? That's great. I am sure you will have students for life. What wonderful memories..with such a talented grand mother! I think you have some artists on your hands! They did a great job. I like their little quilts. Thanks.....I love seeing them create!! Sounds like a great day was had by all. The apples didn't fall far from the tree. How fun! Hmmm I wonder where that artistic temperament and talent comes from? !